How many buggies are out there? It's so confusing, ESPECIALLY when manufacturers call their models, sport and jogger but they may not be suitable for either! 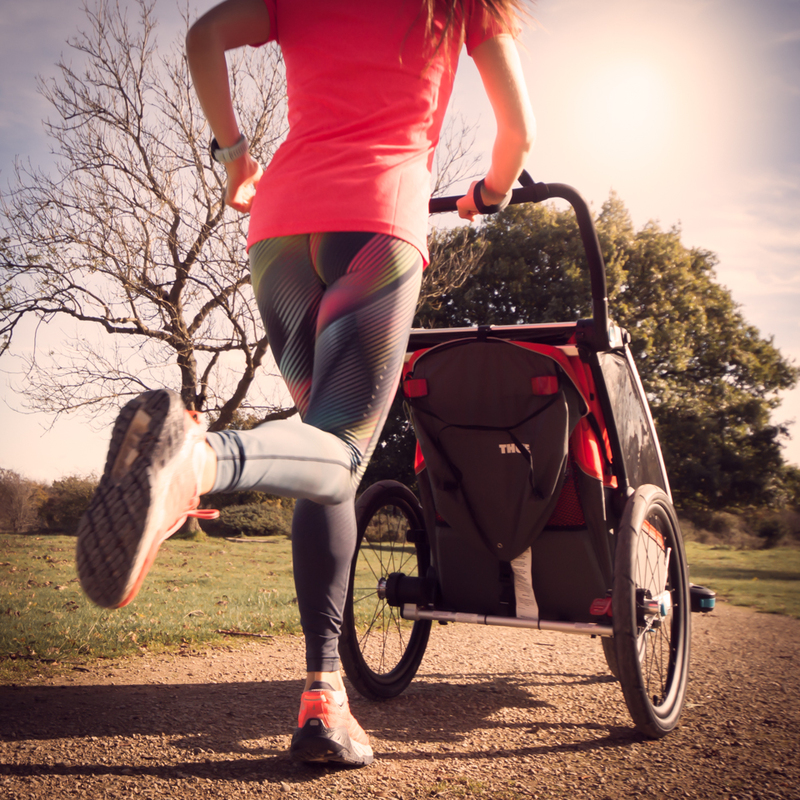 One of the first questions to ask yourself is, do you want a buggy just for running (you already have a travel system for other things) or do you want it to be your everyday buggy too? If its 'just for running' then a fixed front wheel buggy is a great option. This provides the best stability at speed and has larger wheels all round. Larger wheels will offer a smoother ride over uneven terrain like trails, pot holes or fields. This smoother ride is not only more comfortable for your little one but it also makes it easier for you to push. And that means less adaptations to your running posture, reducing the risk of injury. Some fixed front wheel models have less storage options than their swivel front wheel counterparts, having been pared down to limit the weight so check on that if you want to carry a 4 pint of milk home. And on that note the best fixed front wheel running buggies are LIGHT! Circa 10kg which again means that your running biomechanics are less challenged than a buggy weighing 15kg (plus child). All models have suspension and although the types vary there isn't much difference in the performance, just make sure you have some! Most have handbrakes which are great to have if you live in a hilly area. The best buggies in this category are the Out n About Nipper Sport V4, Thule Glide and Bugaboo Runner. The Bugaboo has the added benefit of being compatible with your normal Bugaboo seat and also being the only one on the market to offer parent facing or world facing. The best buggies in this category are the Mountain Buggy Terrain, Britax BOB Revolution Pro and Thule Urban Glide. What if I want to use a running buggy and attach it to my bike? Multisport trailers have been popular for many years now and the Thule Chariot ones that RunningBuggies.com stock are the best. You have a metal arm which attaches to the bike rear axil when biking, a fixed running wheel for jogging and 2 small plastic swivel strollers wheels for walking. They even have an optional ski kit! I love that you can seal them up which means that toys, technology or snacks don't fall out. Plus it is a lovely cocoon in bad weather or has a black mesh during the summer keeping bugs out. The bike trailers don't come cheap and although there are cheaper versions out there but the challenge with these is their weight and lack of suspension. I would not advise using a bike trailer for running if it doesn't have suspension. In younger children (under a year) they need extra support via a sling insert or padded head insert. These buggies are heavier and more expensive than a normal buggy because of the construction but they are also built to last so will have good resale value. They are bulker to fold up and require more space in the boot. However I'm still using mine for my 5 year old and 3 year old which tells you something about their durability and fun for the kids! Best multisport buggies are the Thule Chariot Cross single or double. Are they compatible with a buggy board? No, the footbrake mechanism on all these buggies limits that but Mountain Buggy do have a scooter which attaches and acts in the same way for a sibling. Do any convert into doubles? No. The Phil n Teds Sport is a popular buggy but it's not a running buggy (12 inch wheels and no suspension) plus it's pretty heavy so not advisable. Do they fit through doorways? Yes all the singles do but not all the doubles. How easy are they to get in my car? It's best to look at the dimensions on our Compare page. The rear wheels come off all models very easily which means we have never had any complaints from customers on this! If you have any other specific questions do get in touch with me, wendy@runningbuggies.com or ask the members of my Facebook community, The Original Buggy Runners.